This Victorian étagère is magnificent. 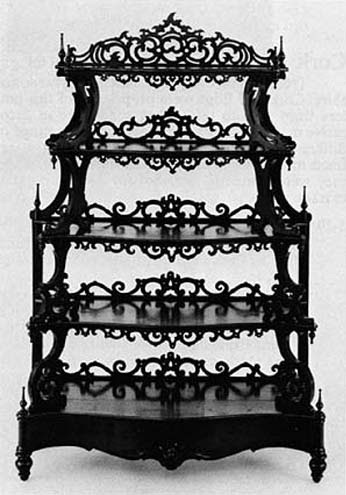 It depresses the hell out of me that it's basically impossible to find this kind of design today — and if you wanted to commission it, you'd pay an exorbitant amount for it, since you'd be getting real craftsmanship instead of flat-pack quality. Money might not buy happiness, but I bet this plus a set of old, leatherbound Shakespeare volumes would get me pretty close.